The Sawmill is a family friendly restaurant and bar open year round on the Seaside Park Boardwalk at the beautiful Jersey Shore. With indoor and outdoor seating, a quick service boardwalk counter, and two full service bars, you’re sure to find what you’re looking for at The Sawmill! We started out with the best on the boardwalk, then we made the biggest! Sawmill Pizza isn’t just pizza – it’s a Jersey Shore tradition. Not in the mood for a pie? Not to worry, we have a full menu for you with great selections of appetizers, boardwalk favorites, salads, sandwiches, wraps, burgers, pasta dishes and more! Be sure to try our thirst quenching crushes and cocktails, fresh cold beer on tap including local New Jersey craft beers, or flavorful frozen drinks. 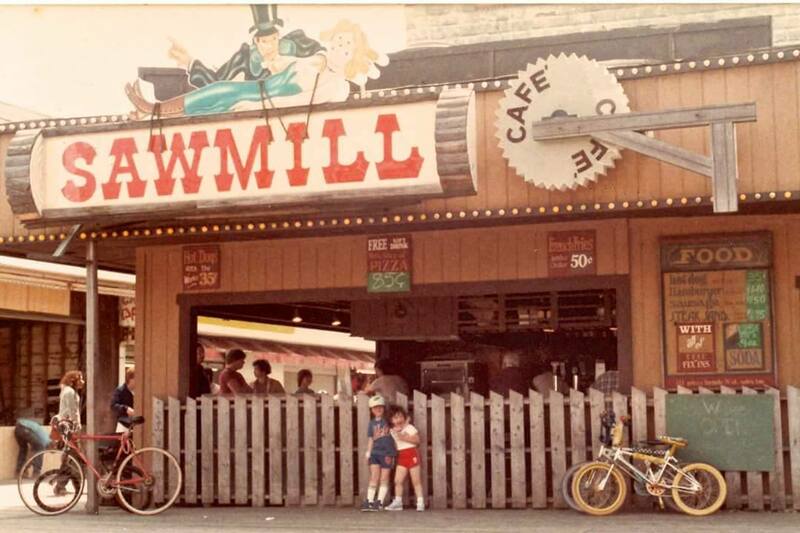 When The Sawmill first opened more than 40 years ago on the Seaside Park Boardwalk, it began as a small hot dog stand outside the entrance to Funtown Pier. Funtown Pier’s featured attraction was the Log Flume, and the hot dog stand’s proximity to the Log Flume was how The Sawmill got its name. The stand quickly expanded, thanks to the success of the addition of our signature Jumbo Slice. Over the years, The Sawmill grew to the full service restaurant we know and love today. As the only building on Seaside Park’s boardwalk to survive both Hurricane Sandy in 2012 and the subsequent fire of 2013, we like to think of The Sawmill as a proud reminder of what the boardwalk once was and the anchor for what is yet to come. We have expanded over the last several years of rebuilding to offer Sawmill Express – quick service when you aren’t looking for a sit down meal, The Sand Bar – a sun lover’s paradise where you can sip in the sand, Sunrise Cafe – a summer seasonal breakfast offering upstairs in Park Pavilion – a wedding and event venue on our second floor with available ceremonies on the beach. We also have many new neighbors this season on the Seaside Park Boardwalk, like Blue Cup Coffee, Park Arcade, Vintage Anchor Boutique, Playa Bowls, Park Seafood, Kohr’s and more! We are located in the Park Pavilion building at the south end of the Seaside Park Boardwalk. There is metered parking in a large lot right next to our property. Parking is enforced April through October. Sign up to receive the latest news on our upcoming events and special offers!